We are seeing more of the Mark Helfrich stamp upon the Oregon offense become evident through this 2014 season, yet an old Chip Kelly game plan has remained with the new head coach. Using plays in the playbook infrequently and then storing them for years at a time is becoming a norm for Helfrich and Offensive Coordinator Scott Frost. This one play, the QB Sweep Read/RB Bootleg was amusing as heck when it popped up against Cal with Charles Nelson as the RB, and it occurred to me that we have seen the play before, but when? My subconscious pulled it out from our game against USC in the Coliseum in 2012, but was it the same variation or am I recalling it wrong? Over time I look to build an “Oregon Playbook” as so many high school coaches have asked me for it, and I know that Pac-12 opponents already have Oregon’s offense mapped out. So it is time to build one of those entries and have fun comparing the present to the recent past with the QB Sweep Read/RB Bootleg play! It’s a QB Sweep Read…or a RB Bootleg? This is just so fascinating! In the Oregon Spread Offense we have the Sweep Read, which is a staple for the offense, but the running back always follows the pulling linemen to the corner. Not this time, as the roles have reversed (above) and the QB can pull the ball (yellow dotted line/arrow) and follow the pulling offensive linemen (green arrow) or hand off to the RB, who is effectively running a bootleg on his own in the opposite direction (orange dotted line/arrow). 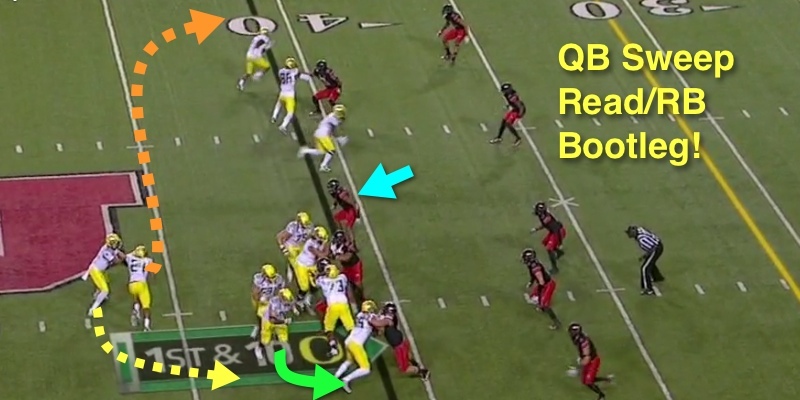 Note how Mariota is “reading” the defensive end (Light blue arrow) to determine who will carry the ball. I believe he determined that since the DE “sat,” he should hand it off…although I could make a case that “sitting” requires pulling the ball because the QB has the blocking numbers on his side going to his right. Speed and powerful running was Tyner’s formula in this game. You just have to love the speed that Thomas Tyner has and the resolve he showed once he turned the corner. Of course if I were he and I saw THOSE three out blocking for me (Lowe, Brown, and Marshall), I would get pretty motivated to head downfield. 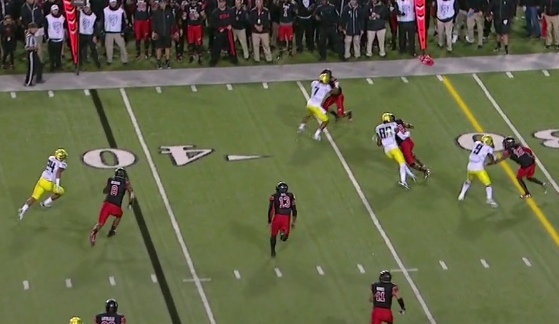 Are they the BEST downfield blocking receivers ever at Oregon? 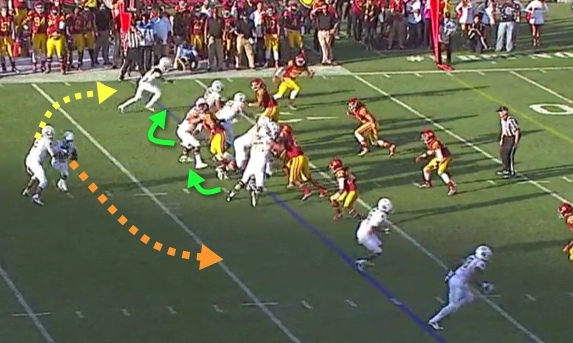 Thomas can almost cruise (above) and get ten yards, as the aforementioned Nelson did against Cal. But it bothered me for a while after the Cal game–was that play in the bowl game against Kansas State, or against USC in 2012? There it is! The QB Sweep Read and RB Bootleg of 2012! Now THAT play from 2012 looks familiar (above) as Marcus (yellow dotted line/arrow) could follow the pulling linemen (green arrow), or hand off (to Kenjon Barner — orange dotted line/arrow) as he did on Saturday against Utah. We see the defensive end (light blue arrow above) of USC being “read” and since Marcus believes that Barner can beat a flat-footed DE to the corner? He hands off. 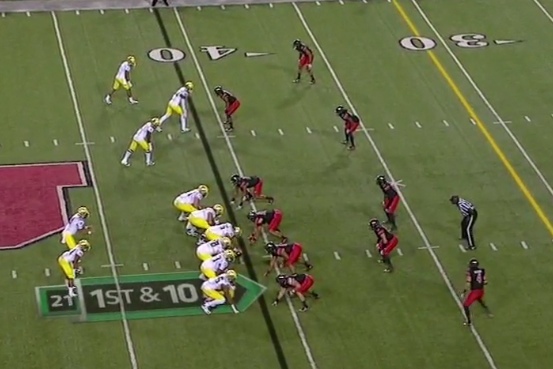 It is not a bluff, as Oregon WILL run the QB Sweep! Whoa Doggies! 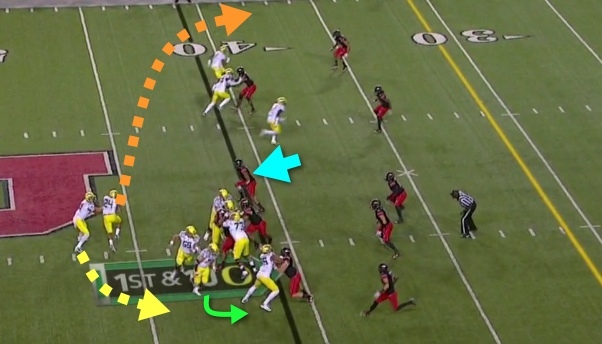 The Ducks are not just faking the QB Sweep Read part of it, but following through. 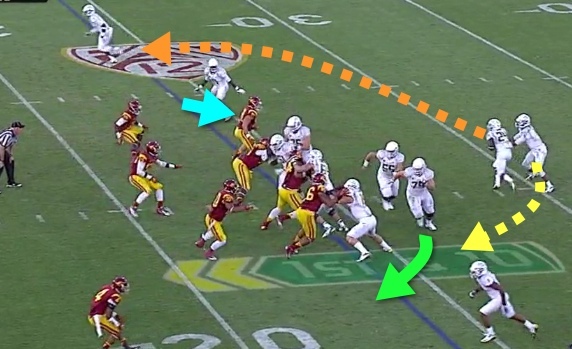 In that same USC game (above), we see that we have reversed blocking, as Outside Zone Read blocking is going up for the QB (green arrows), and the RB is doing a bit of a bootleg if he gets the handoff (range dotted line/arrow). Mariota (yellow dotted line/arrow) is pulling the ball and following the blocking! The opposing defense MUST defend both directions–truly spread out! You never get tired of watching Marcus run, whether it is two years ago (above) or the present. He has a flair for tip-toeing down the sideline for great gains to keep a drive going, as that too remains consistent in his game. My friends–I know that the technical definition of a bootleg is a QB running it with little blocking, yet as the Grizzled Ol’ Coach advised me on this…misdirection is the heart of a bootleg — AND the double-edged threat of this play. Another way of describing it would be a “Naked” option for the RB, but we settled on bootleg because it seems to have that spirit of deception that the original definition contains.